Combine the current trend of large, open floorplan homes with integrated kitchen, dining and living rooms and add the ongoing popularity of vibrant paint colors, and you can have a problem. 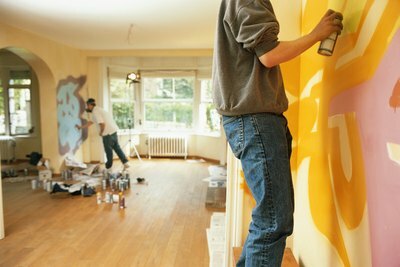 Transitioning from one paint color to another when the wall runs unbroken from the kitchen to the living room can present a challenge. There are several methods for making the color divide look natural, instead of awkward. Depending on the colors you choose, the rooms can blend together with a subtle change in hue or be dramatically different with bolder colors. Look for an architectural break in the wall to naturally divide the colors. This could be an archway, doorway or the narrow backsplash wall between the upper and lower cabinets. If there is a natural break, or just a small strip of wall, transitioning from one color to another at that juncture won't look choppy. Use a decorative paint trick to create a division between two colors. This can be a checkerboard column of squares, a curved free-form line, zig-zags or stripes. Use different shades of the wall colors and lines or shapes that echo other decorative elements in the room. Paint a single diagonal line instead of a vertical one to divide the colors. Experiment with masking tape on the wall to determine the angle and placement. 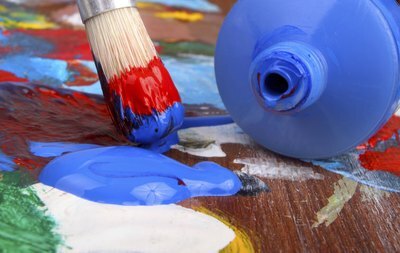 Blend the two colors together, as long as the two colors mixed together don't make a third color (for instance, mixing a red with a green will make muddy brown.) On paper plates, mix the colors and apply them with a sponge or damp rag so they gradually blend from one to another. Install a decorative column where you want to divide the colors. Look in decorating showrooms and home improvement stores for columns designed to be attached to a wall. 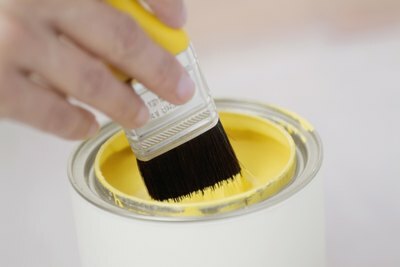 Paint or stain it the same color as the rest of the trim or cabinets. Keep the ceiling and trim the same color throughout to maintain a flow and avoid making the rooms look too choppy. Avoid using two very different or complementary colors unless your decor is already fairly bold. Use different shades of the same color or colors in the same family. If you decide to paint a single vertical line between the two colors from floor to ceiling, find a tall narrow sculpture or decorative screen to place in front of it so it doesn’t look too abrupt. Get testers of the colors and paint samples side by side on the wall to make sure they look good. It’s hard to predict color from the little paint swatches. If you can't figure out how to divide a wall without it looking strange, ask yourself how one of the colors would look extended all the way into the other room.